In this riveting entry in the celebrated thriller series, former intelligence operative Will Cochrane—a "ruthless yet noble" (Ft. Worth Star-Telegram) man from whom "Bond and Bourne could learn a thing or two" (Madison County Herald)—comes out of hiding to expose a conspiracy involving a past assassination that reaches to the highest echelons of the U.S. government. Three years ago, intelligence officer Will Cochrane was brought in by a Delta Force colonel to assassinate a terrorist financier in Berlin. After the job, the commander vanished, and hasn’t been heard from since. The details don’t quite add up, and one of the CIA agents who was involved has been investigating the mission. He reaches out to Will for help, but before they can connect, the CIA man is poisoned. Will is determined to uncover the truth about Berlin, even if it means putting himself in the crosshairs. Framed for multiple murders, the skilled former spy has gone deep underground to evade his enemies and the feds. But honor and loyalty to his old colleague thrust him into danger once again. When Marsha Gage at the FBI discovers that Cochrane—one of America’s Most Wanted—has resurfaced, she immediately launches a manhunt, and she won’t stop until she brings the former CIA/MI6 operative in. With time running out, Cochrane will use all of his training and formidable skills to outmaneuver the FBI and uncover a shocking conspiracy that will rock the foundations of our nation . . . if he can stay alive. Three years ago, intelligence officer Will Cochrane was brought in by a Delta Force colonel to assassinate a terrorist financier in Berlin. After the job, the commander vanished, and hasn’t been heard from since. The details don’t quite add up, and one of the CIA agents who was involved has been investigating the mission. He reaches out to Will for help, but before they can connect, the CIA man is poisoned. Will is determined to uncover the truth about Berlin, even if it means putting himself in the crosshairs. Framed for multiple murders, the skilled former spy has gone deep underground to evade his enemies and the feds. But honor and loyalty to his old colleague thrust him into danger once again. When Marsha Gage at the FBI discovers that Cochrane—one of America’s Most Wanted—has resurfaced, she immediately launches a manhunt, and she won’t stop until she brings the former CIA/MI6 operative in. 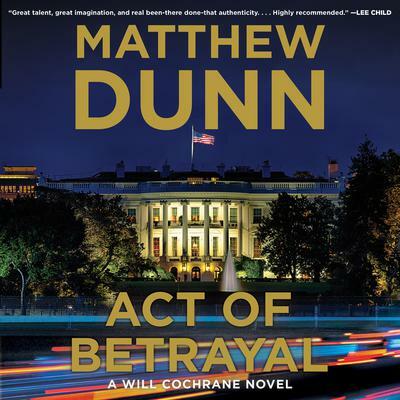 With time running out, Cochrane will use all of his training and formidable skills to outmaneuver the FBI and uncover a shocking conspiracy that will rock the foundations of our nation . . . if he can stay alive.